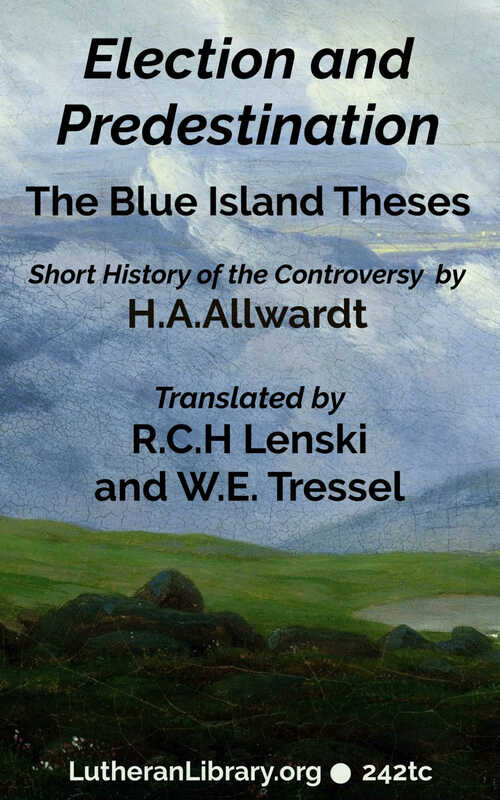 “On November 16, 1881, 12 pastors and teachers, 4 representatives of congregations, and 9 guests met at Blue Island, Illinois to discuss the new doctrine of predestination the Missouri Synod had begun to teach at that time. Besides this a number of letters from pastors and laymen were sent in, heartily favoring the purpose of the meeting. “Most of these represented congregations…had left Missouri as a result of the issue. “This book describes the five theses which came out of the meeting and were approved by the representatives. 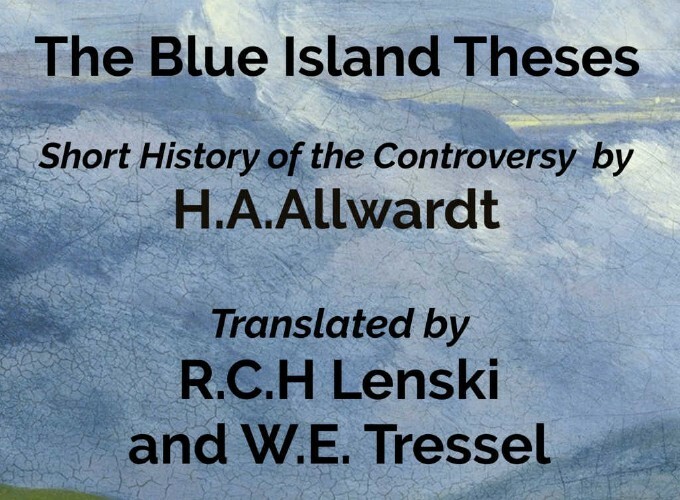 What Are The Five Blue Island Theses? God has irrevocably elected unto salvation before the foundation of the world all those who are saved in time. Election is revealed in the Scriptures, and is therefore no more “a mystery” than any other article of faith. Election is revealed in the Gospel and not in the law. The Gospel directs us to Christ – God has elected in Christ. Christ’s merit is considered in election not merely as obtained for us, but also as apprehended by us – God has elected in view of faith. “From conversations with many Missouri pastors since the inception of the controversy we know that it was almost impossible for them to swallow the new doctrinal propositions, and they dare not even to this day present them openly and honestly to their congregations. “These are indeed miserable conditions, and we can only thank God for having preserved us and strengthened our hearts to fight against the error. The aspersions cast upon us we can bear readily, knowing that a day of just judgment is drawing nigh. “Our purpose is simply to raise our united voices in warning: Beware, O Lutheran Church of America, beware! Missouri, so highly favored and blessed – Missouri with Dr. Walther at its head – has fallen into great error, into an error which affects the very foundation of our salvation – God’s eternal love for sinners. “Missouri indeed comes with an indignant denial. And, in fact, it does not explicitly deny that God has loved all men, that the Son of God has redeemed all, and that God in a certain sense would have all men to be saved. Missouri confesses all this, and often clothes it in beautiful words, finer than we are able to produce. And yet by the side of this its teaching Missouri adheres to a doctrine of predestination which in very fact annuls the universal love of God. “Missouri itself confesses that apparently the doctrine of predestination contradicts the doctrine of God’s universal will of grace; it tells us that the connection between these two doctrines is a mystery; and under cover of this “mystery” it seeks to establish this doctrine in the Church. “Beware, O Lutheran Church! This “apparent” contradiction is a real contradiction, a contradiction of the fundamental doctrine of the Scriptures, namely that God had such compassion upon all men as to render the salvation of all in reality possible. When our opponents speak of the universal will of grace, they still for the most part speak correctly; but when they speak of predestination, their words are false. Paul tells us that a little leaven leaveneth the whole lump. But our opponents have mixed the truth of the Scriptures not with “a little”, but with a good-sized lump of error. “Away with non-revealed mysteries in this or in any other doctrine! If there are real mysteries, i. e. real truths which it has not pleased God to reveal to us, then they are well taken care of in God’s hands, but they do not belong to Christian doctrine. If, however, there are “mysteries” which directly contradict the revealed Word, then they are lies of the devil. General Introduction. Introduction To The Doctrinal Discussion. Thesis II. Election is revealed in the Scriptures, and is therefore no more a “mystery” than any other article of faith. - Missouri – Faith in Election – Faith in Justification - Missouri Doctrine of Election and The Biblical Doctrine of Grace - Thoughts of a Troubled Heart - Chemnitz, Contingency - If You Are To Be Saved - Romans 11:33, etc. - Missouri Repeating The Role of Israel - Election Revealed in Scripture - Certainty of Salvation Conditional - A Missourian On The Witness Stand - Luther To A Heart Troubled About Predestination - The Windy Thing on Legs - Dr. Walther’s Postille - Is It Any Mystery Why God Did Not Ordain All To Eternal Life? Thesis IV. The Gospel Directs Us To Christ – God Has Elected In Christ. - We Place No Merit In Man - Dr. Walther’s Proof of Our Supposed Synergism - Luther, The Confession, The Scriptures, Speak As We Do - Baier and Huelsemann Speak As We Do - Quenstedt Speaks Likewise - Faith Impels God?